Dutch Oven Artisan Bread: loveliest bread in the land! My first loaf of Dutch Oven Artisan Bread: isn’t it a beaut?? My daughter-in-law, Sonia, months ago, raved about a new bread recipe: a very simple artisan bread that she baked in her Dutch oven. It seems that the Dutch oven (with the lid in place) was the perfect hot and steamy setting to make this gorgeous bread with the amazing crunchy crackly crust, and the dense and chewy interior. Affiliate link (natch): I’d like to get one of these soon! It blows me away that Amazon.com has free shipping on these pans—they are so heavy! The only other thing you need to make this bread, is this recipe. (Thanks, Sonia, for sharing it, and for the baker chick blog, where Sonia found a similar recipe, to begin with). And what a bonus: it’s easy-easy-easy-peasy. 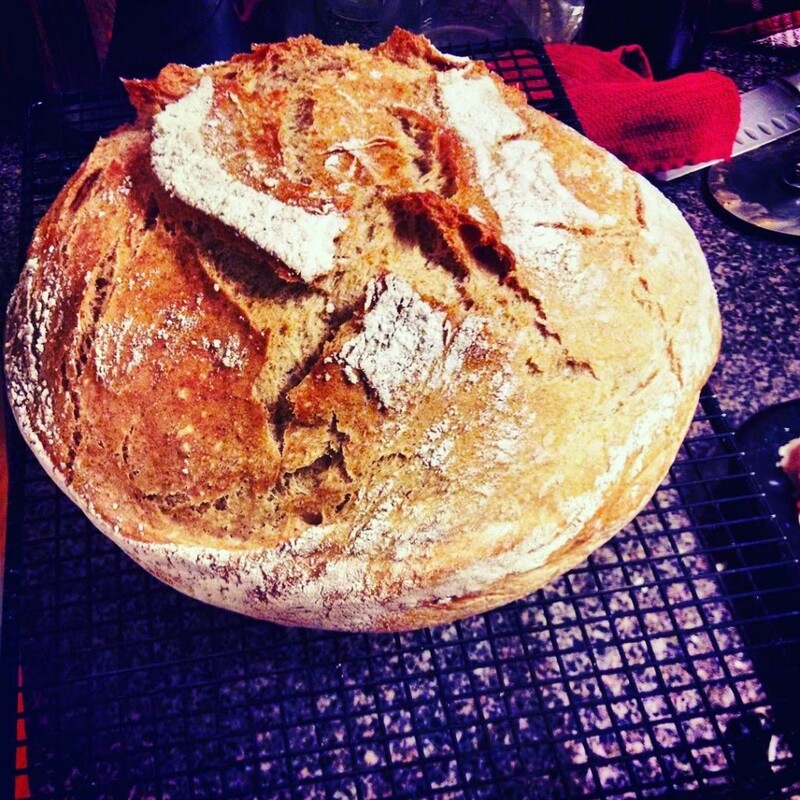 Dutch Oven Artisan Bread: the loveliest bread in the land! In a large bowl, stir together the flours, salt and yeast. Add the water and stir together with a wooden spoon, until mixture resembles a shaggy dough. When dough is ready, preheat oven to 450 F.
Turn the dough onto a well-floured surface, and with floured hands form the dough into a ball. Cover with the plastic wrap and let the dough rest. While dough is resting, put your Dutch oven into the oven as it preheats, for at least 30 minutes. Carefully remove the Dutch oven from your oven, removing the lid very carefully. Slash the loaf, and carefully place it into the Dutch oven. Replace the cover, put Dutch oven back into the oven, and bake for 30 minutes, covered. Remove the cover and bake for an additional 15 minutes uncovered. Bread will be golden, crusty and delicious! Pull out the softened butter, baby! A note about timing: with the really long rest-and-rise period for this dough, you could conceivably stir it together in the morning and let it sit all day long while you are at work, or going about your business, and then pop it into the oven to have with dinner. Your life will be better because of this. I promise. Tagged on: best crusty artisan loaf how to make, cast iron pan bread recipes, how to make artisan bread in a cast iron pan, how to make artisan bread in Dutch oven, what kind of cast iron Dutch oven should I buy? ……ready? 50 cents! YES by golly I did. And it was beautifully seasoned inside to boot! Have you priced those puppies lately? I think I got a deal don’t you : ? ) I really like the coral color but I have my eye on a soft pink one also…YES 2 Dutch ovens is ideal! I had a friend give me a similar recipe a couple years ago! We love it. 🙂 My mother-in-law got on a Dutch oven kick and bought me a pretty enameled one from Sam’s for my birthday. I wasn’t very familiar with it, so it took me a bit to get excited. But now I LOVE it! Especially for soups, and breads, and so much more! My friend had told me that this bread recipe didn’t work well with whole wheat flour (which disappointed me), but I think I will try your version since it has some whole wheat flour in it too. It makes me feel healthier. Thanks for sharing! Do you butter or oil the pan at all? Thanks! I do give the pan a quick rub of olive oil, with a paper towel. Good question! After the bread is in a ball shape how big is it supposed to get before putting in the the oven? Meredith: it’s not a fussy dough, but I think a good rule of thumb is to let it get about twice as big before you put it in the oven. Good luck! You say yeast. What kind of yeast? Instant? KAren, I buy dried yeast in bulk at the grocery store or Sam’s Club. I keep it in the freezer to keep it fresh and it has never let me down! Traditional active yeast is what I use, Karen. I found your website by accident while looking for a recipe. I just love it and have told some people about it. I have only tried one of your recipes but hope to try a lot more. I made the artisan bread and for someone who has only made bread from the frozen loaf state other than one other time when I tried a so called “no fail” bread that would have made a great door stop. My bread turned out wonderful the FIRST time, and I have made it 3 times since with one raising right now. My ONLY problem has nothing to do with your recipe but with my knives; trying to cut slits in the dough before you bake it. Can you suggest a good brand of knife that is sharp enough for this task? Thanks in advance.